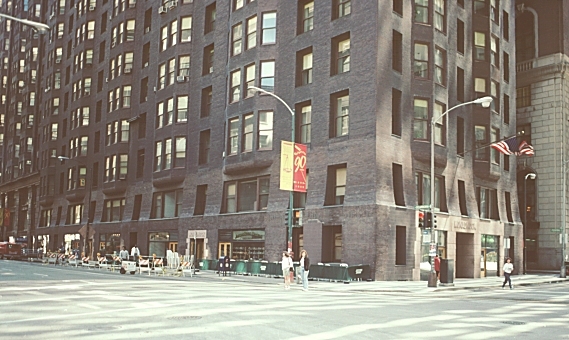 Images of Monadnock Building, Burnham and Root, Chicago, 1893. Digital Imaging Project: Art historical images of European and North American architecture and sculpture from classical Greek to Post-modern. Scanned from slides taken on site by Mary Ann Sullivan, Bluffton College. 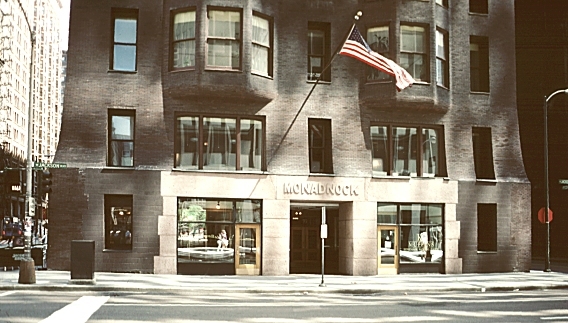 Internationally famous at the time of its construction as the world's largest office building, the Monadnock Building has a two-story base, 13 floors of offices and an attic and cornice. It is 197 feet tall. Some of the walls at the base are six feet thick. Originally the building had four separate entrances, each named after a mountain in New England. 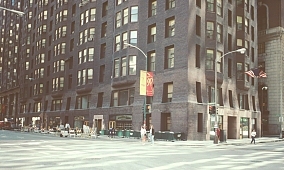 The original entrance was the Jackson Street entrance (see above right). 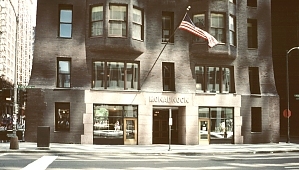 It became known as the Monadnock Building, even though each of the four entrances had a different name. Unlike the earlier Rookery, this structure lacks ornament and has a greater sense of unity and coherence. The bays move in and out in a very subtle way. 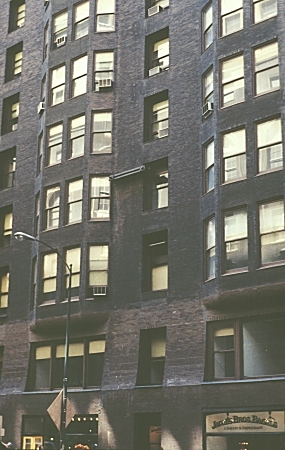 Other Burnham buildings on this site include: the Frick Building, Merchant's Exchange Building, the Pittsburgh Union Station, the Reliance Building, and the Rookery.